I picked the chicken because it is a very popular on our catering menu being ordered almost daily as well as being a perfect fit for spring and summer menus. It is a spin on a traditional dish. Pre-heat frying Oil to 350⁰F. Roll Chicken Breasts in flour to coat and shake off excess flour. Mix Cream and Egg together to form an egg wash and dip in wash to coat well. Mix Italian Seasoning, Panko, Salt & Black Pepper together and coat breasts then shake off excess. Deep fry breaded Chicken for 3 minutes or until golden brown. Remove from oil and place on a baking rack on a sheet pan and bake for 7 minutes at 350⁰F or until the internal temperature of the chicken reads 165⁰F. 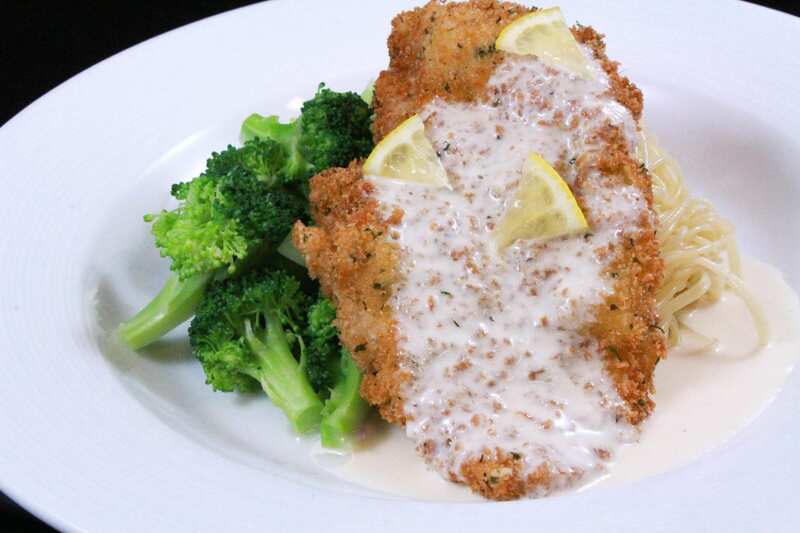 Serve alongside Buttered Broccoli, Angel Hair Pasta, and a Lemon Butter sauce.